Only a Grinch could complain about summer. What's not to like? There's beach time, sunshine, barbeques and a break from the usual hectic pace. But for the purposes of concealed carry, summer's a bit like a vintage Cadillac convertible: sure it looks great, but try finding a parking space for this behemoth. You'll also have to trailer a fuel truck behind you to feed the gas-chugging V8. And then there's rain. Stylish? Yes. Practical? Not so much. Likewise, summer presents some basic challenges for concealed carry. Thinner, lighter clothing makes carrying without printing more difficult. And unless you like to sweat, cover garments aren't an option. No one wants to go defenseless just because it's warm outside; but what to do? Master Holster Designer Gene DeSantis is an avid concealed carrier and creates designs with these kinds of exceptional conditions in mind. Conventional holsters aren't going to cut it in summer, so he's come up with some ingenious holster designs that redefine warm weather concealed carry. We've put together a list of unconventional summer holsters that will blow your mind but will never blow your cover. 1. GUN CADDIE could easily be mistaken for a camera or bicycle accessory pouch. It's made from ballistic nylon and slips easily onto your belt using the attached loops on back. You can conceal all small frame autos and revolvers in a separate compartment and a Velcro tab that allows access to the firearm. This way you can carry and retrieve your keys, wallet, credentials, without revealing your handgun. 2. PISTOL PACK - This lightweight pouch accommodates the NAA Guardian .32 and most other similar size small autos, along with a spare magazine. Heavy-duty YKK® zippers, a tough spring steel clip and padded ballistic nylon assure you many years of service. For safety, this holster also features a D-ring to accommodate a lock when storing your handgun. 3. POCKET TUK is a dual-purpose pocket and tuck-able IWB holster. The reinforced mouth aids in re-holstering, and the suede construction helps keep it all in place. Each Pocket-Tuk™ is supplied with a hex key to facilitate clip removal for pocket use. The sleek design won't leave a print in your pocket. 4. The UNDERFIRE™ Bra holster ensures that women can maintain their personal defense in warm weather. The holster body is molded from Kydex® sheet to precisely fit your small pistol or lightweight revolver. The Underfire(TM) exterior is covered with smooth suede to provide extra comfort against bare skin. Worn horizontally tucked beneath the bra band, your gun can be rapidly drawn by pulling straight down on the grip. This bra holster comes with three different size hanger straps for a perfect fit for varying body types. 5. THE INCOGNITO™ This discreet belt holster is built from a sturdy 1060D padded Senior Ballistic Nylon and cleverly hides your small semi automatic handgun in plain sight! The shape and material looks similar to a weather-proof phone case and can be worn horizontally or vertically. The gun compartment is sealed with a reliable Velcro® fastener. 6. GUNNY SACK - Our gunny sack holsters are probably the most copied and imitated holsters in the history of holster making! And with good reason. But purchasing a DeSantis Gunny Sack ensures you're getting the genuine article. DeSantis Gunny Sacks are rugged, convenient, comfortable and dependable. A Velcro® sealer gives you full access to the handgun. 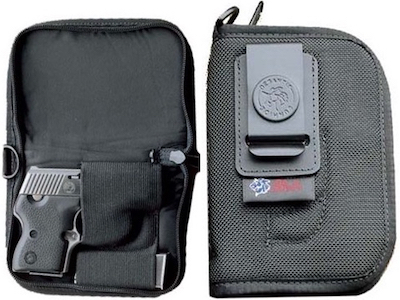 The holster insert with elastic retaining strap allows for safe retention and quick access.